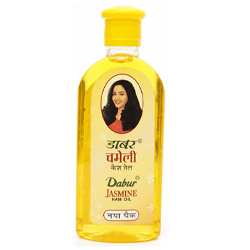 Buy Dabur Jasmine Hair Oil. Fragrance of Jasmine, thick hair, beautiful hair. Online Shopping of Dabur Products. For ages, the enchanting fragrance of Jasmine has spellbound people. Dabur Jasmine Hair Oil has the same fragrant goodness of Jasmine that gives your hair a new life and makes hair long, thick and beautiful.